Last weekend we had a nine-hour photo shoot to capture images for the cards in Specimen. We shot over 90 setups and took 3500 pictures. We’ll spend the next few weeks editing them into all the cards and promo materials. Thanks to our behind the scenes crew: Jill Vanc, Jodi Brown and Phil Freeman. And now, we present the crew of the TCS Brown: Carly Joy, Steve Baldwin, Eric Neal, Eric Van Tassell, Ele Matelan, Alan Vuchichevich and Leena Kurishingal! 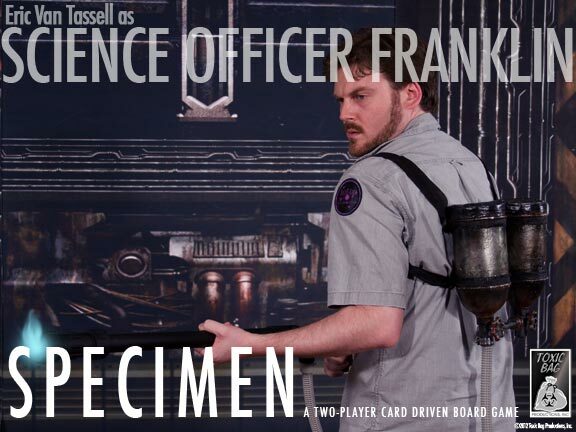 We recently sat down with game designer Steve Baldwin to talk about his board game project “Specimen.” Read the full interview here.